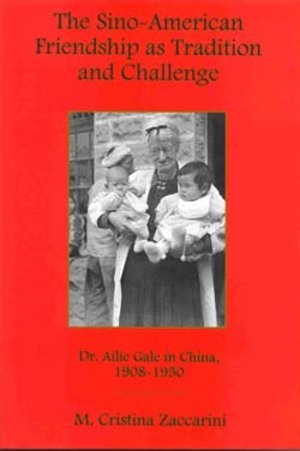 Dr. Ailie Gale was a prototypical woman missionary who helped change Americans' traditionally uncomplimentary image of China. However, Gale's and other women missionaries' writings remain largely unexamined by scholars who wish to explore Americans' conceptions of the "special friendship" between China and America in the decades of the twentieth century leading to World War II. To understand the historical context of Gale's letters, Professor Zaccarini explores the meanings and values typical to Gale and a presumed "sisterhood" of supporters. Scholars have successfully shown how nineteenth-century women missionaries' promotion of an exalted image of American women in comparison to their "heathen" counterparts retarded the universal mandate of gender equality. Zaccarini accepts this view while explaining that the women's conservatism simultaneously challenged Victorian constraints. While working for the missionary cause, Gale and her Northern Methodist "sisters" emphasized female and male spiritual equality and the traditional woman's duty of service to God. Fulfilling pious motivations, some nineteenth-century women missionaries challenged male authority by raising funds, speaking in public and pursuing an education equal to that of men at a time when these activities lay outside the parameters of appropriate female Victorian behavior. Zaccarini suggests that Gale inherited aspects of the traditions and challenges of the "sisterhood," applying them within the context of both the twentieth century China mission field and restrictions upon women in medicine in the United States. As a female hospital administrator in Nanchang, Tunki, and Tzechung, China, Gale challenged the concept of female subservience and disproportionately low representation in the American medical field. While her hospitals often suffered from the chronic lack of funds and supplies that plagued other women physicians in the mission field, Gale's letters astutely credited American and Chinese supporters with her hospitals' successes, thereby forging a link among American and Chinese supporters and the principle of female advancement in the field of medicine. More specifically, Gale described her medical work in a manner which countered existing trends in the United States. By the early twentieth century, the more nurturing forms of healing traditionally associated with female doctors increasingly gave way to mainstream Americans' respect for the rational, scientific notions espoused by, and associated with, men. Gale told of Chinese support for her medical efforts, illustrating that China, with its long traditions of Confucianism and Taoist medicine, was more amenable to both women doctors and the type of holistic healing associated with them. Finally, Gale emphasized Chinese strength and self-sufficiency while simultaneously identifying a weak moral fiber as inherent to modern American culture. She traced this apparent strength to certain aspects of Chinese culture, as well as to proof of the success of Christianity. In so doing, Gale's writings posed a challenge to the hierarchical order based upon the perceived weakness of the Chinese, and the subordination of women and the values they represented.